In this post we explore a practice strategy that enables you to develop a richer and more interesting rhythmic soloing vocabulary. Rhythm is one of those essential things that can make or break a piece of music, or a guitar solo. Some players may play a lot of stuff, they may have great technique and the right equipment, but their playing can sound dry and boring. A common culprit for this is their relationship with rhythm. They may be too mechanical and not really grooving, or more commonly, their rhythmic vocabulary may be poor and repetitive, lacking rhythmic variation. Temporarily limit the melodic material you are going to be using to just a few notes and practice over a backing track. This way you are forcing yourself to be creative with a very limited set of choices. You can’t play your favorite licks, you can’t play up and down a scale, basically you need to get out of your comfort zone. Your only options are expression, articulation and most importantly rhythm. These things are not complicated brainy concepts, but rather natural, intuitive elements that every player can easily develop. The only reason some stay behind in these areas, is just the fact that they never allowed themselves to work on them specifically. Relax and experiment with this it, allowing yourself to sound bad before you sound good, especially in the beginning. Do it and you will see results from the first practice session. 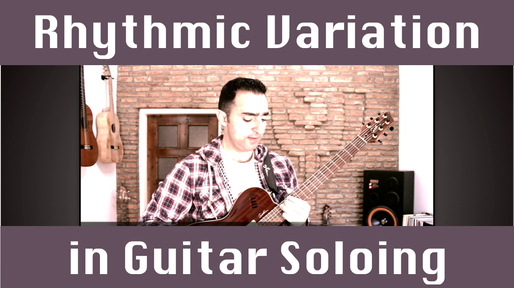 You will be on the way to making your soloing more exciting and interesting! In the video you can see a couple of examples from my SFS series of online courses, where we do this at the early stages, when the melodic material is still limited. The first one is from SFS Pentatonics, and you will see me playing just 2 notes of C minor Pentatonic over a backing track. The second one is from SFS Melodic Minor Modes, and I am using 4 notes of C Phrygian 6, which is the second mode of the Melodic Minor scale. I hope you enjoyed this and that you put it to good use. Please share this post and help me spread the word. If you haven't already, I also invite you to get on my mailing list where I share a lot more lessons and practice materials. Practicing what I showed you is a lot of fun and it does help you improve quickly, so enjoy your practice and be effective! Watch "Play ALL Pentatonics WITHOUT MEMORIZATION"